The HV18 Hydraverter is an alternative way to run hydraulic tools. By connecting a Hydraverter to existing hydraulics on equipment such as a backhoe, excavator, or skidsteer loader; hydraulic tools can be operated. The Hydraverter is more affordable and portable than a traditional power unit and utilizes equipment commonly found on a jobsite. 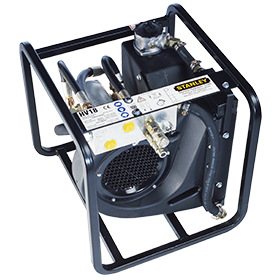 With cooling capabilities, the HV18 allows for long operation time without damaging the tool unlike diverter valves. Two models are available to meet the input flow from the carrier, the HV18300 is designed for 16-35gpm equipment while the HV18301 is for 13-25gpm equipment.